Confused by the timing of the Affordable Care Act? What takes effect when? 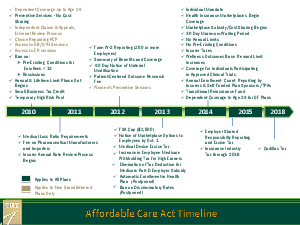 With so many provisions and rules involved in the Affordable Care Act, it can be quite overwhelming. This timeline covers from 2010 through 2018 in a clear, 1-page layout. It also indicates what provisions apply to all plans and those which apply only to non-grandfathered plans. It’s a great piece to keep in front of you so you can stay on top of compliance and the actions you need to take.